I’m so excited to finally announce that The Ivy Leaf Agreement is finally being released! On October 6th it will be released worldwide. We have physical CDs, limited edition screen printed covers and the world and his wife of digitals. Head to bandcamp and you can hear the full record as well as pick up a copy. If iTunes is your vice, head here. It’ll also be available from all other digital retailers and streaming services. A year later and I finally update this site… We have finished recording 14 songs and are just awaiting the final part of the processing before we can get them out to you. Demonstrating Disasters is out for free download, or you an pick up a CD copy of it here or a limited edition CD Vinyl version here. 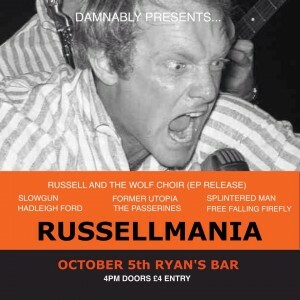 We have a kind of a fuller show this Saturday, supporting our friends, Passerines, at Ryan’s Bar, Stoke Newington. Tickets are £3 on the door and it starts at 8. Boogie! I’ve been playing in London over the past few and there’s a slew of more shows coming up. Come hang. A dear friend bought me new tees to sell as a gift, designed by Alex from We Three Club. Very limited, only 25 which come with a hand numbered label. It’s summer, maybe you might want one on your back? We’ve started pre-production… again. For real this time. Not that the last time wasn’t for real, but due to scheduling conflicts everything kind of became nothing. We have a tentative date set to record 14 tracks in the mighty Holy Mountain Studios. I have no idea what will become of these songs, but I hope that each and everyone one of these songs will make their way to you as either a CD, vinyl or digital download. Maybe all 3? Doubtful, but once complete, we can start bringing some full band shows to a town near you… or just in London. I am very proud of how these songs are shaping; some old, some new; it’s just great to finally hear them being played as they are in my head. Demonstrating Disasters: over a year ago I started recording a little 5 track acoustic EP. Dave Woolf, from Corporal Machine and the Bombers, kindly played some lapsteel and guitar on it at various points when our calendars allowed us to. Its finally being mixed and mastered at the moment and will be available on a free download or a limited edition run of 100 CDr and 10 vinyl CDrs on Hearts & Stars Records. I think that’s all I can give you right now.